What is The Hate Has No Home Here Campaign? The Hate Has No Home Here campaign originated in the North Park neighborhood of Chicago, and has spread worldwide. 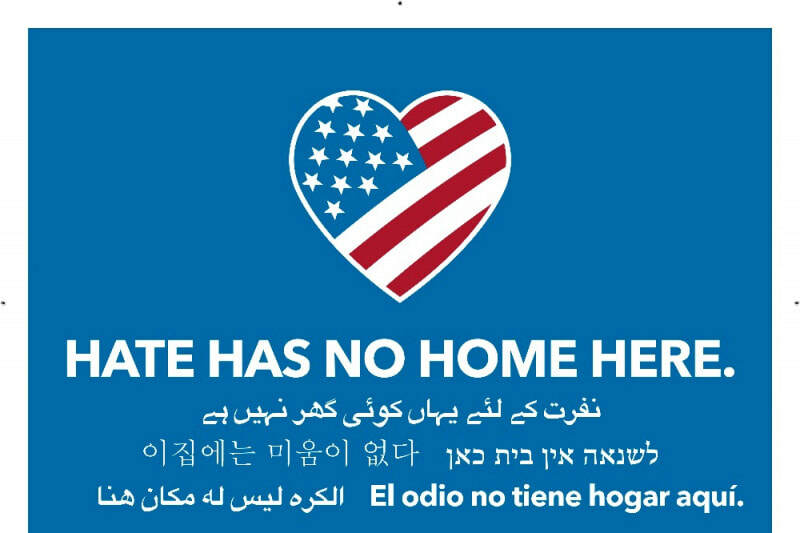 The phrase used in the graphic was imagined by a 3rd grader and Kindergartener at a neighborhood elementary school (the two boldly declared “hate has no home here”), with artwork donated by designer Steven Luce. Thousands of posters have been distributed across the country, and the world. WHAT IS HATE HAS NO HOME HERE ABOUT? Hate, unchecked, can make neighbors feel fearful and unwelcome in their own communities. The Hate Has No Home Here project seeks to declare neighborhood residences, businesses, and places of community free from hate speech and behavior, providing safe places for conversation, work, learning, and living. 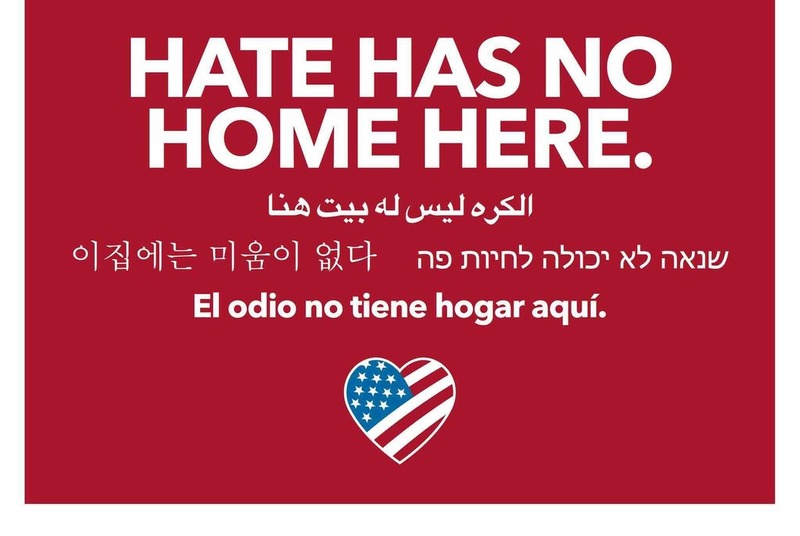 Hate Has No Home Here encourages other communities to participate in combating hateful messages and behavior in their neighborhoods by going beyond the poster or sign. In the North Park neighborhood, they have used this opportunity to gather neighbors, start conversations about protecting and encouraging each other, and make plans for using resources to educate others. The “Hate Has No Home Here” sign project began with a group of neighbors from North Park, a Chicago neighborhood characterized by its diversity of age, race, nationality and ethnicity. Many ties bind the residents of North Park to one another; the most notable is the neighborhood school, Peterson Elementary School, where the student body mimics the demographics of the neighborhood and where educators and families are committed to celebrating diversity. The phrase used in this poster was imagined by a third grader and kindergartener at Peterson Elementary School; Steven Luce, a North Park neighbor and designer, created the graphics; and neighbors Catherine Korda, Barbara Nordlund, Megan Trinter, Carmen Rodriguez, Jeanne Marie Olson and Kurt Peterson secured the translations, organized and launched the campaign. The Hate Has No Home Here movement is built around a simple idea: it’s easy to hate people we don’t know. Posters and yard signs are just the beginning. What starts as powerful, positive messaging continues in relationship-building, dialogue, and communal action. When neighbors of different races, religions, and nationalities move past indifference to investment in one another, we knock out the underpinnings of racism and intolerance, and make possible a better future for our communities. How can I get a sign? Our goal is to provide a sign to every home in the Greater Taunton area that wants one, free of charge. As a non-profit, we are collecting monetary donations on a rolling basis to continue to pay for signs. Each sign should cost us around $5 each, and all funds donated will go directly to the creation of more signs. We will continue to pass the signs out as long as there is a need and we have funds to provide them. Thank you for supporting "Hate Has No Home Here" in the greater Taunton area! If you would like a sign, please email the church office at office@firstparishtaunton.org or call 508-822-2107 to arrange for a pickup time.